Opened in 1979, is a well-equipped, well-lit, and adaptable indoor facility, and amongst the best in the Region. There are 10 firing points at 25 and 20 yd and 20 at 10m. 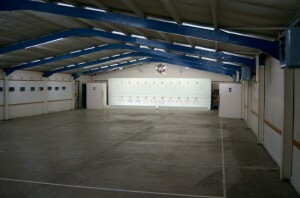 There is a large clubroom, separated from the main range, with a mini-kitchen, toilets, and adjacent parking. It is generally accessible, having level access from the car park, which is a bit uneven, but OK for wheelchairs and scooters. There are two WC’s close to the entrance. Though not yet compliant with current regulations, one has a sliding door. The club can provide all the equipment you need to get you started. We recommend that you wait util you’ve tried our sport before you buy equipment. We have a large range of .22 rimfire rifles, 0.177 air rifles and pistols plus associated equipment such as jackets, telescopes, and ear protection. The club stocks 0.22 rimfire ammunition and 0.177 wadcutter pellets, for purchase. It is illegal for anyone without a firearms certificate (FAC) to take 0.22 rimfire ammunition from the range, or anyone U18 to take pellets. We can store unused rounds for your next visit. 0.22 LR rimfire, standard velocity (subsonic), unjacketed. Pellets: lead only, unjacketed, wadcutters preferred. Europod Exchange 29 Jun-5 Jul: Accommodation for young people. Sutton Coldfield 10m Open Airgun Comp, 8/9 Sept.